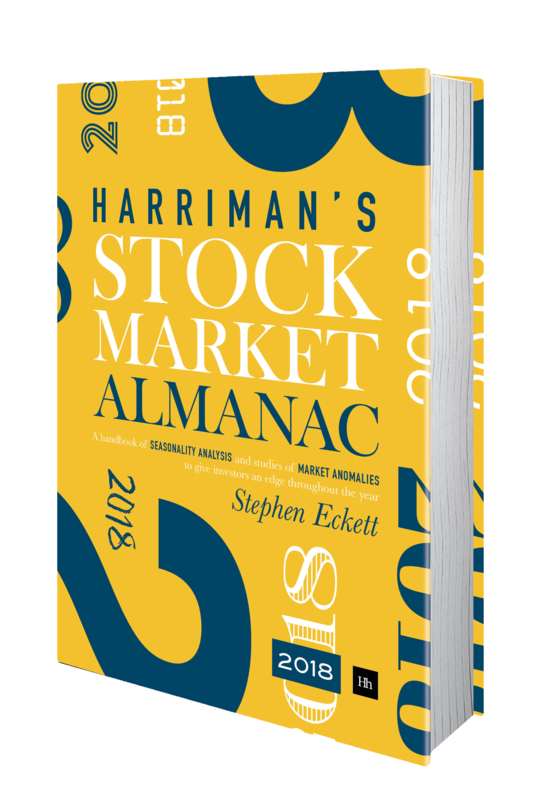 A couple of years ago the Almanac wrote about a strange characteristic of the UK equity market which was the difference in performance in odd and even weeks. The original article is here (see the original article for the definition of odd/even weeks etc.) To recap briefly, the FTSE 100 Index saw much stronger returns in odd weeks than even weeks. Let’s see what’s happened recently and if this strange characteristic still exists. 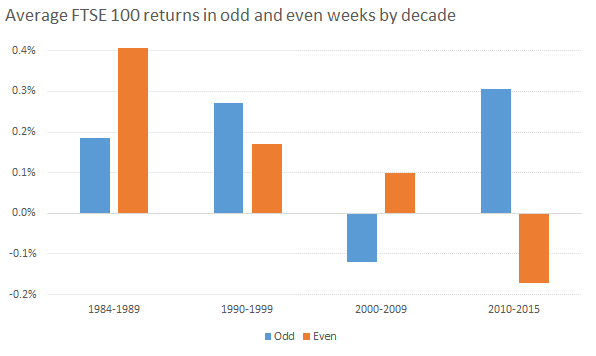 The following chart shows the FTSE 100 average returns for odd and even weeks for the period 2010 to 2017, and also for the individual years 2016 and 2017 (to date). As can be seen, for the period from 2010 the FTSE 100 has seen on average positive returns in odd weeks and negative returns in even weeks. In effect, for the last few years in aggregate all the growth in the index has been due to its performance in odd weeks. In 2016, the market on average did see positive returns in even weeks (albeit still less than the odd-week returns). 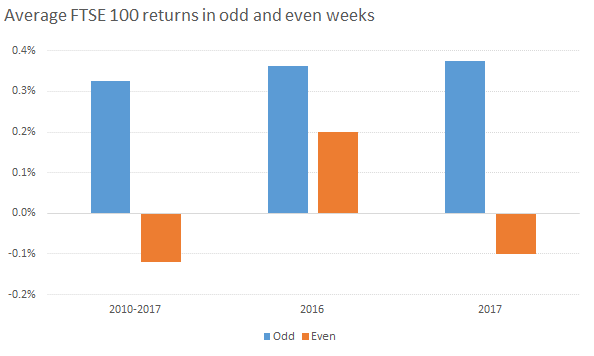 But so far in 2017 the longer-term trend has reasserted itself, with strong odd-week returns and negative even-week returns. The following chart updates the performance of two hypothetical portfolios: one of which only invests in the market in odd weeks, and the other only invests in even weeks. The significant divergence in performance previously observed has continued to today. 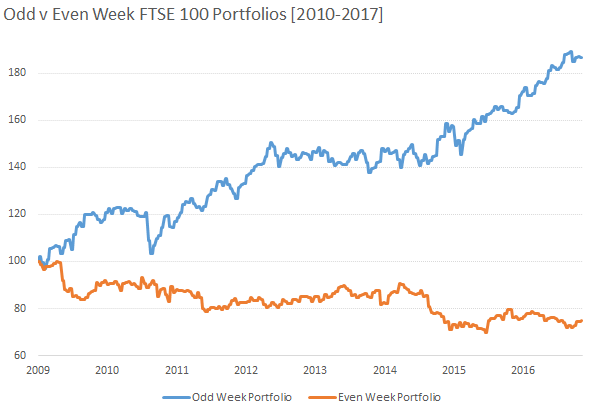 Having started with values of 100 in 2010, by November 2017 the Odd Week Portfolio would have had a value of 187, compared with a value of 75 for the Even Week Portfolio. 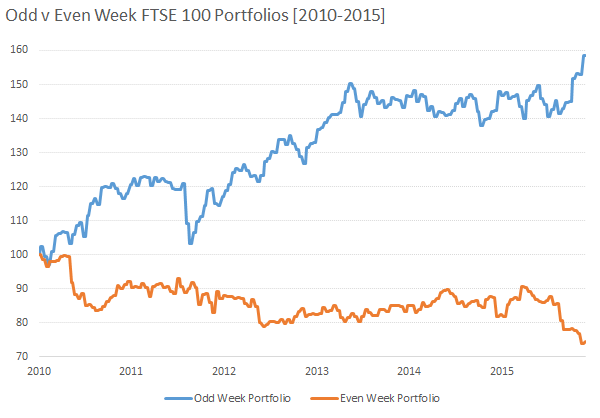 The change in value of the Even Week Portfolio has changed little from 2015, whereas the Odd Week Portfolio has grown strongly. As mentioned in the original article, there is no obvious reason for this weekly phenomenon, although such weekly effects have been seen elsewhere – for example, the FOMC Cycle.